So not ready for Monday morning. We had a good weekend, just too short as usual. On Friday night we hung out with the gang downtown at Hessen Haus. It was Amiyna's last weekend in town (*insert sad face here*). B and I had a good time hanging out with her and the guys. I was peer pressured into trying alligator at Hessen Haus, apparently since I am from the South it was shocking that I had never tried it. Let's just say that was the first and last time I will be eating it. Not my thing. On Saturday I went to Art Fest West at the Village of Ponderosa and there were some pretty awesome artists there. My fave was the booth with the glass sculptures and flowers. 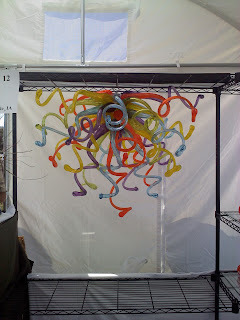 Amazing glass sculpture at Art Fest. Bein & his fancy appetizer.